How do you form ionic compounds? The formation of ionic compounds comes from the ion rules of the periodic table. The first and most important rule of forming compounds is that they have to add up to a charge of zero unless otherwise stated. If we put two ions together, one positive and one negative, then we have to add as many elements to each side until we get a sum of zero. In math they call this the smallest common multiple. You can usually do this in chemistry by multiplying together the two numbers you are dealing with. Examples: Put these two elements together to form an ionic compound. What is the charge on Na? What is the charge on S? What is the least common multiple between 1 and 2? How much Na do you need to add up to +2? How much S do you need to add up to -2? If you have 2 Na and 1 S what does the compound look like? What is the charge on Ba? What is the charge on P? What is the least common multiple between 2 and 3? How much Ba do you need to add up to +6? How much P do you need to add up to -6? If you need 3 Ba and 2 P what does the compound look like? What is the charge on Mg? What is the charge on OH–? What is the least common multiple between 2 and 1? How much Mg do you need to add up to +2? How much OH do you need to add up to -2? If you need 1 Mg and 2 OH what does the compound look like? PRACTICE PROBLEMS: Put these two elements or ions together to form an ionic compound. 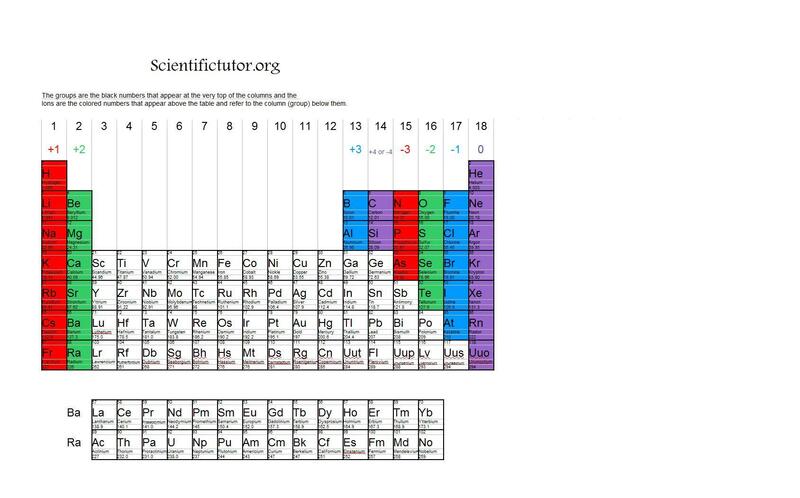 Don’t Forget to use the ion rules of the periodic table, if you need them.